Guido Basso has been called one of the greatest musicians to ever come out of this country. 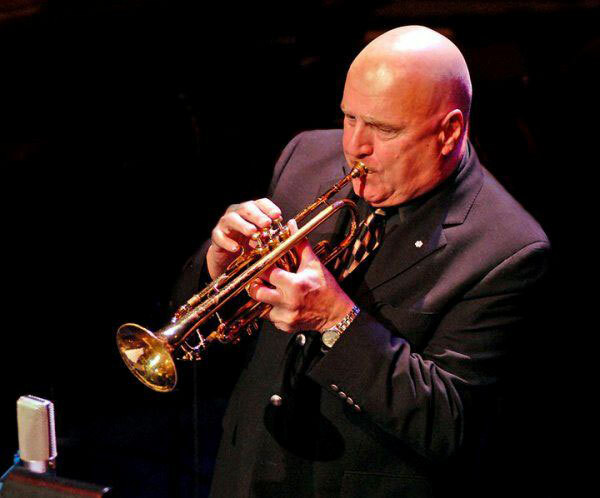 A two-time Juno Award winner (Traditional Jazz Album of the Year in both 2003 and 2004) and a member of the Order of Canada, he specializes in trumpet and flugelhorn. But the Montreal native is also a harmonica player, an arranger and a conductor. A full house greeted Basso and his quintet for the opening of the 19th season of the Brantford Downtown Jazz Series, Oct. 26 in the Sanderson Centre lobby. He led his band, featuring vocalist Irene Atman, through a night of mainly smooth jazz numbers and ballads. Beginning with All the Things You Are, a Jerome Kern tune, Basso’s soft flugelhorn tone, combined with saxophone solos by Pat LaBarbera, amazed the audience. Over the last three decades LaBarbera has been a mainstay on the Toronto jazz scene. For seven years, he toured and recorded as the featured tenor saxophone soloist with the Buddy Rich Band. Fine brush work alternated with loud, aggressive play by drummer Terry Clarke, ended the lengthy song. Clarke is five time winner as Drummer of the Year at the National Jazz Awards and like Basso, is also a member of the Order of Canada. An incredibly tight rhythm section, including pianist Mark Kieswetter and bassist Pat Collins were solid and after a few songs Basso introduced vocalist, Irene Atman. During I Love Being Here With You, by Peggy Lee, she added a new slick layer to the smooth jazz sound. I Wanna Be Loved, originally by the Andrews Sisters, begged for a slow dance, with loving lyrics and muted trumpet. In true jazz form, Basso cut the song off in order to restart it in a slightly different tempo. During intermission he said that he has played in Brantford at least half a dozen times and that this was the first time organizer Frank DiFelice would not be appearing as the drummer. Wearing his Order of Canada lapel pin and answering questions about some of the many awards he has received, he is humble and direct. Outside of music, he spends his time reading and cooking and he said it is important to find time to relax. The second set started with a bang. Cotton Tail, by Duke Ellington highlighted the show, as the saxophone bopped at its’ hardest pace of the night and the band was threatening to break into a hard-bop blitz. Drums galore and horns trading lines had the heads in the audience nodding. Bringing the tempo drastically down for a medley of ballads, You’ve Changed, The Masquerade is Over and Old Folks, Basso noted of the unintentional yet ironically chronological course of a hypothetical life implied through the titles. “There’s a story there,” he said with a laugh. “Maybe, if we were good enough tonight, one day we could come back and play the Brantford Jazz Festival,” Basso slyly suggested. The Brantford Downtown Jazz Series continues November 16 when the Canadian Jazz Quartet returns.